Repeated motif present between transmembrane helices in cystinosin, yeast ERS1p, mannose-P-dolichol utilization defect 1, and other hypothetical proteins. Function unknown, but likely to be associated with the glycosylation machinery. Some membrane bound proteins possess a pair of repeats each spanning two transmembrane helices connected by a loop [(PUBMED:11731489)]. The PQ motif found on loop 2 is critical for the localisation of cystinosin to lysosomes [(PUBMED:11150305)]. However, the PQ motif appears not to be a general lysosome-targeting motif. It is thought to possess a more general function; most probably this involves a glutamine residue [(PUBMED:11731489)]. There are 17604 CTNS domains in 9802 proteins in SMART's nrdb database. Taxonomic distribution of proteins containing CTNS domain. This tree includes only several representative species. The complete taxonomic breakdown of all proteins with CTNS domain is also avaliable. Click on the protein counts, or double click on taxonomic names to display all proteins containing CTNS domain in the selected taxonomic class. Severity of phenotype in cystinosis varies with mutations in the CTNS gene: predicted effect on the model of cystinosin. Infantile nephropathic cystinosis is a rare, autosomal recessive disease caused by a defect in the transport of cystine across the lysosomal membrane and characterized by early onset of renal proximal tubular dysfunction. Late-onset cystinosis, a rarer form of the disorder, is characterized by onset of symptoms between 12 and 15 years of age. We previously characterized the cystinosis gene, CTNS, and identified pathogenic mutations in patients with infantile nephropathic cystinosis, including a common, approximately 65 kb deletion which encompasses exons 1-10. Structure predictions suggested that the gene product, cystinosin, is a novel integral lysosomal membrane protein. 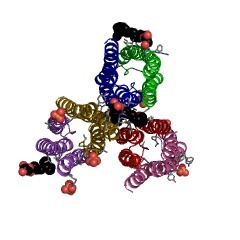 We now examine the predicted effect of mutations on this model of cystinosin. In this study, we screened patients with infantile nephropathic cystinosis, those with late-onset cystinosis and patients whose phenotype does not fit the classical definitions. We found 23 different mutations in CTNS; 14 are novel mutations. Out of 25 patients with infantile nephropathic cystinosis, 12 have two severely truncating mutations, which is consistent with a loss of functional protein, and 13 have missense or in-frame deletions, which would result in disruption of transmembrane domains and loss of protein function. Mutations found in two late-onset patients affect functionally unimportant regions of cystinosin, which accounts for their milder phenotype. For three patients, the age of onset of cystinosis was <7 years but the course of the disease was milder than the infantile nephropathic form. This suggests that the missense mutations found in these individuals allow production of functional protein and may also indicate regions of cystinosin which are not functionally important. A novel gene encoding an integral membrane protein is mutated in nephropathic cystinosis. Expression cloning of a novel suppressor of the Lec15 and Lec35glycosylation mutations of Chinese hamster ovary cells. Lec15 and Lec35 are recessive Chinese hamster ovary (CHO) cellglycosylation mutations characterized by inefficient synthesis andutilization, respectively, of mannose-P-dolichol (MPD). Consequently,Lec15 and Lec35 cells accumulate Man5GlcNAc2-P-P-dolichol andglucosaminyl-acylphosphatidylinositol. This report describes the cloningof a suppressor (termed SL15) of the Lec15 and Lec35 mutations from a CHOcDNA library by functional expression in Lec15 cells, employingphytohemagglutinin/swainsonine selection. The SL15 protein has a predictedmolecular weight of 26,693 with two potential membrane spanning regionsand a likely C-terminal endoplasmic reticulum retention signal(Lys-Lys-Glu-Gln). Lec15 cells transfected with SL15 have normal levels ofMPD synthase activity in vitro and convert Man5GlcNAc2-P-P-dolichol toGlc0-3Man9GlcNAc2-P-P-dolichol in vivo. Surprisingly, SL15 also correctsthe defective mannosylation in Lec35 cells. The SL15 protein bears noapparent similarity to Saccharomyces cerevisiae MPD synthase (the DPM1protein), but is highly similar to the hypothetical F38E1.9 proteinencoded on Caenorhabditis elegans chromosome 5. These results indicate anovel function for the SL15 protein and suggest that MPD synthesis is morecomplex than previously suspected.